It is incredibly easy to create Sunday school activities about forgiveness with Children's Worship Bulletins. Simply search our extensive library by the topic of forgiveness and the level (ages 3-6 or ages 7-12) desired. Each Children's Worship Bulletins takes a familiar Scripture passage from the Old Testament, the Gospels or the Epistles and presents it as a picture, maze, code, or other puzzle to make learning fun. Here are just two examples of activities that you can use with our Children's Worship Bulletins to make Sunday school activities about forgiveness fun and educational for your group of kids. Print the "God Blots Out Sins" activity page and answer key from the Children's Worship Bulletin website. "God Blots Out Sins" activity page for each child. A small prize for each member of the winning team. Direct one team as follows, "In the key, start with the cat and use the code word to fill in each cat-marked space below the key. Then, move on to the dog, using the code word to fill in each dog-marked space. Continue taking each symbol of the key in order, from left to right and top to bottom, to fill in all corresponding coded-spaces." Direct the other team as follows, "On the first line of the puzzle, start with the first space (marked with a rabbit) and fill in the code word using the key. Then, move on to the next space (marked with a horse), filling in the code word from the key. Continue filling in code words, taking each space in order, from left to right and top to bottom." Explain the object of the game, "The goal is to be the first team finished with the puzzle." Yell, "GO," and wait for the first team to finish. Have the winning team read aloud the deciphered verse. Have the entire class recite Isaiah 43:18-25 to reinforce the lesson. Print the "What else did God say?" activity page and answer key from the Children's Worship Bulletins website. "What else did God say?" activity page for each child. Divide the class into teams of three members each. Assign each team member a number "1," "2," or "3." Direct the teams as follows, "The member assigned '1' should start. On the lines of the puzzle, write all the words in the key marked '1' in order. The member assigned '2' should then return to the top of the key and write all the '2' words in order. Continue until all three team members have written their words in the puzzle." Sign up for our 30-day, no obligation trial period and see just how much fun your kids will have with Sunday school activities about forgiveness. 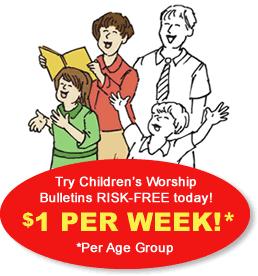 Download, print and provide your kids ages 3-6 and ages 7-12 with weekly, topic-based or Scripture-specific bulletins. At the end of 30 days, cancel and owe nothing, or subscribe for only $7.49 a month when you choose electronic delivery. Your second age version is half price! Sign up now — you have absolutely nothing to lose.